UPDATE, DECEMBER 6, 2018: The damaged floating dock departed the Bremen yard via tug. It is now at the Lürssen facility in Hamburg. As of this morning (15th September), the fire has been under control. According to the fire department, there is no further danger of the fire spreading, although fire suppression measures will continue for the time being. Currently, about 180 fire fighters of the Bremen fire departments and of the surrounding counties as well as the fire department of the Jos. L. Meyer Shipyard are on duty, but are being gradually released. We would like to express our sincere gratitude for the tireless efforts and professional response of all those involved, including the fire service, police, the technical support unit, and our own employees. Currently no statement can be made at this stage as to the cause of the fire or the extent of the damage. 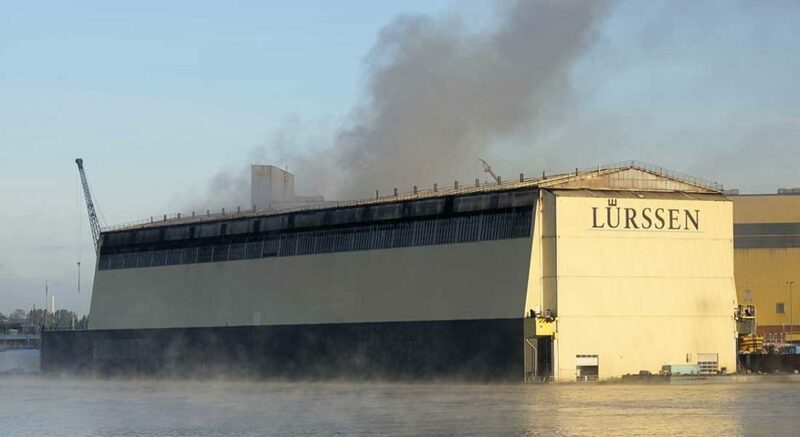 A fire broke out in the floating dock at Lürssen’s Bremen-Aumund shipyard, onboard the megayacht inside as well. While the fire lasted several hours, it is under control at press time. The fire began around 2 a.m. local time in Germany. Fire officials tell Radio Bremen and other local media that more than 150 personnel from Bremen and Lower Saxony responded. They used fireboats as well as ladder trucks in the efforts. By 10 a.m. local time in Bremen, the officials state, they had the fire within their control. They explain that the height of the floating dock, about 115 feet (35 meters), was a challenge for the ladder trucks. In addition, they add, flames were affecting at least three decks of the megayacht. Media reports conflict as to the identify the yacht, as well as her anticipated completion date. Fire officials did not identify the megayacht. The floating dock measures 426 feet long (130 meters). 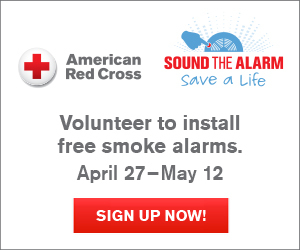 While smoke was heavy during the fire-fighting efforts, it’s no longer impacting the local community. Shipping traffic on the Weser River, where the Bremen yard sits, continues flowing unimpeded as well. In the early morning at approximately 02:00 a fire broke out in the floating dock of the Fr. Lürssen Shipyard in Bremen-Aumund and onboard the yacht within it. The emergency procedures commenced immediately, in the course of which the persons still working on board were evacuated and examined with respect to possible smoke intoxication and the fire fighting department and emergency response teams were alarmed. Additionally the whole premises were evacuated. Currently, no casualties are known. At the moment, 110 fire fighters and rescuers are onsite, also supported by a team of the Jos. L. Meyer shipyard. Further buildings or other ships were not affected. No statement can be made so far towards the cause of the fire or the extent of the damage.